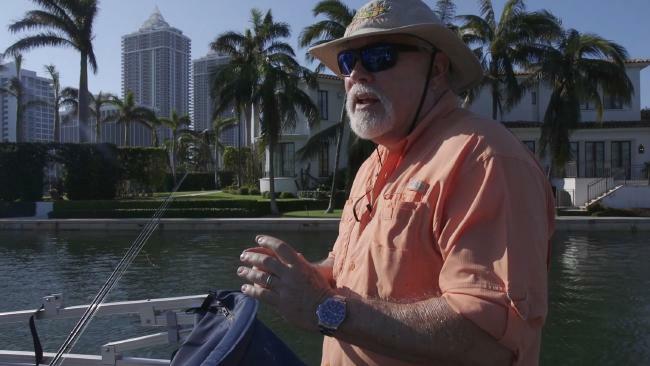 CAPTAIN Dan Kipnis is a retired fishing captain from Miami Beach, and is Chairman of the Miami Beach Marine and Waterfront Protection Authority. Here, he writes about America's First Climate Change Refugees ahead of an SBS documentary on subject. THE world's climate is rapidly changing around us - floods, fires, rising seas, record high temperatures, melting ice and fierce storms. As an American, I have to apologise for our President, Donald Trump, and the bull-headed politicians that surround him. Regardless of Trump's view that global warming is an "expensive hoax", "created by and for the Chinese", I and many others around the world are now on board with the challenges that face us and what we must do to avert the world's 6th extinction; mankind's. I'm a 67-year-old fishing boat captain, so why should I consider myself an educator on the effects of climate change? For the past 11 years, I have been presenting a regularly changing (as is the nature of the science of climate change) presentation to university and high school students, as well as business and civic groups, educating them as to the why's and how's of anthropogenic-caused global warming. My education began by training with Al Gore's Climate Reality Project, specifically to present on his book, An Inconvenient Truth, and its film companion. Since then, I have presented hundreds of times to thousands of people. Thankfully, over the past 11 years I have seen a sea change in people's awareness of what is surely the greatest challenge ever to confront the human race. Around 1975, I first started to notice that barnacles on pilings around my home in Miami, Florida, were growing higher up. The only way this could be, is due to the water level rising, but we all knew that water levels basically stayed the same. At the time it was a stray thought however, over time other markers came to my attention: warmer water in the summer, changes in trade winds, more frequent algae blooms, warmer and longer summers and shorter winters. I didn't really hear much about why this might be happening until around 1995, when talk of global warming started to become an issue for debate. Over time, as the debate escalated, with the press giving equal time to advocates and deniers, I noticed more changes to the climate that really had no other explanation, other than man-made pollution of the atmosphere with carbon dioxide. First off, burning more hydrocarbons adds more CO2 to the atmosphere, which traps sunlight trying to radiate back to space as infra-red light waves, and in turn the earth heats up. This is about as simple a science fact as there is - not to climate deniers though. They are pushed on by the greed of hydrocarbon producers and the politicians that are in their pockets. The world's inability to aggressively mitigate this problem has pushed mankind to the brink of extinction, and there has been no vigorous action to quickly pull us back from the brink. It is as though we think that we have all the time in the world to "wean" ourselves off fossil fuels. But guess what? We don't! I live in a state, Florida, where Governor Rick Scott won't allow state employees to use the phrases, "climate change" or "sea-level rise". This attitude ignores what is happening all around us - and especially in this state. Sea-level rise is real and the water is rising faster than any scientist had predicted even half a dozen years ago. Miami Beach is flooding regularly with the city raising roads and installing new storm water systems and pumps, in an attempt to mitigate the effects. In the short term this is fine, but in the midterm it's a waste of time and money. The sea cannot be held back, when we heat it up and ice caps melt, sea levels will rise. My house is for sale while I still have equity in it and it is still insurable. Many residents of South Florida, and coastal residents across America, still don't believe in the upcoming disaster. In the meantime, President Trump, his cabinet and Republican members of Congress are doing everything possible to unravel what they consider to be Obama's climate legacy, pulling the US out of the Paris Climate Agreement, and then dismantling every clean air and proactive carbon regulation enacted over the past 35 years. Adding to the assault, the Trump administration is ramping up and promoting coal mining, fracking, drilling and oil exploration, while removing incentives to move us forward with renewable sources of clean energy. The consequences of this endeavour could push the world's chances of escaping the coming climate ravages to nil. All I can say is; I am glad I am an old guy and won't be around to live through what is coming. I am so sorry for all the young people, as we have not kept our moral obligation to leave them a world that is healthy, safe and vibrant. America's First Climate Change Refugees airs on Dateline Tuesday at 9:30pm on SBS. Is La Nina coming this summer? Is this the obituary of coal?